Penelitian - In mice and humans, the gut is lined with a layer of mucus—and it is assumed to be the same in other mammals. But this style of gut lining is a new development, evolutionarily speaking; most invertebrates protect their gut walls with a membrane made of chitin, which acts as a barrier to microbes and helps prevent infection. But until now, scientists were unsure about which came first, or if they are even related. But a team led by Dr. Keisuke Nakashima of OIST's Marine Genomics Unit were keen to find the answers. A new Nature Communications paper has journeyed to the inside of our insides, as a team from the Okinawa Institute of Science and Technology Graduate University has mapped the evolutionary journey of how animal guts have evolved to defend themselves from microbial attack. Chitin is an abundant biological material that is produced by a wide variety of organisms. From crab shells to the cell walls of fungi, chitin is second only to cellulose when it comes to its commonplace existence. A versatile building material for nature, chitin is even found in the gut linings of invertebrates, where it acts as a defensive barrier against potentially harmful microbes. 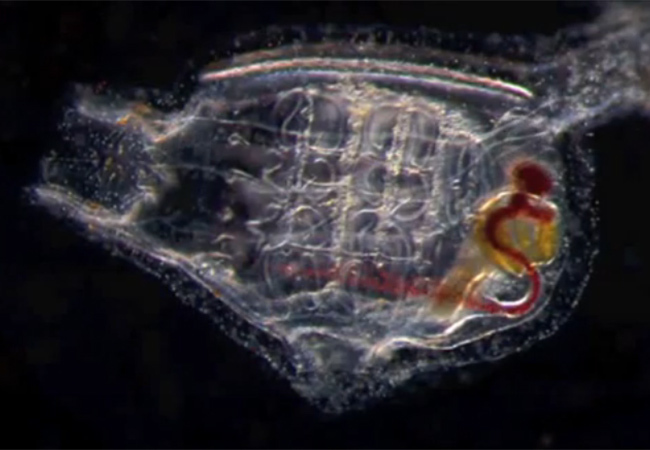 But strangely, most vertebrates don't share this chitin-lined gut. Instead they protect themselves with a layer of mucus that bacteria are able to colonize but not penetrate. Dr. Nakashima's team noticed a group of animals that had both chitin and mucus coexisting in its gut: Tunicates. Also known as sea squirts, tunicates are simple animals that live by filtering food particles from seawater. While they don't have a spine, they are closely related to the vertebrates, with a similar genomic background that make them ideal for studying their evolution. But it's the uniqueness of their gut lining that attracted the research team. "We noticed that tunicates seemed to have an intermediate kind of gut lining that could show that mammalian and invertebrate gut linings shared an evolutionary link," said Nakashima. It wasn't only tunicates that had these transitional linings, other simple chordates like lancelets, jawless fish and some bony fish had an ability to produces chitin in their guts too, in fact the only group of vertebrates to have lost their chitin producing genes completely are mammals. Working with a tunicate species, Ciona intestinalis Type A, the team looked at the surface of their rudimentary gut, which was largely composed of hair-like cilia behind a barrier of nanoscopic fibers made almost entirely of chitin. This mesh of chitin nanofibers is embedded in a surface matrix, which happens to have gel-forming mucin as a major component, which also happens to be a building block of the mucus layers found in the mammalian gut. After chemically preventing some tunicates from synthesizing chitin, the team noticed the tunicates died, but those that were treated with antibiotics were able to survive. The experiment showed the chitin layer had an antimicrobial effect, preventing infection by physically blocking pathogenic bacteria and other harmful microbes from reaching the gut surface. 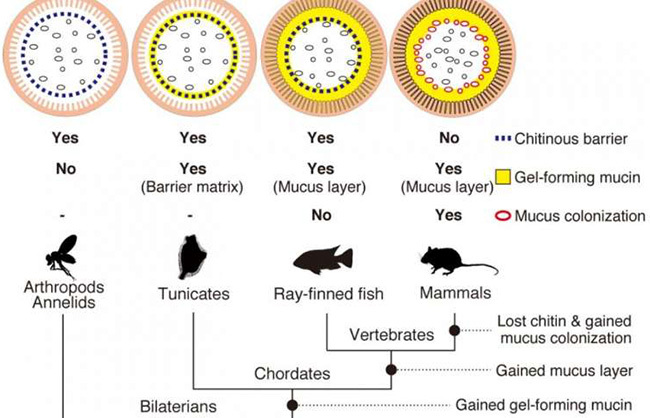 But the presence of mucus in the same space was very similar to more complex vertebrates. It looked as if the tunicates were a kind of missing link between invertebrates like insects that have only chitin as a microbial defense, and mammals that use a mucus layer as a sort of decoy for microbes to colonize, leaving vulnerable cell walls to perform their vital functions unmolested. Running several years' worth of comparative analyses on a variety of chordates, Nakashima's team was able to trace an evolutionary path from one model of gut to the other, cataloging intermediate gut structures that utilized varying quantities of chitin and mucus along the way. It's an unprecedented look into the evolution of one of the most critical body structures that is keeping us all safe from microbes to this very day. Ensure your canine has entry to water.